Finding it difficult to mend fences with Tommy (Colin Donnell) and Diggle (David Ramsey), Oliver (Stephen Amell) instead focuses on crossing another name off the list. While digging through a crooked accountant’s laptop, Felicity (guest star Emily Bett Rickards) discovers a transaction that could help Oliver find Walter. To reconfirm the lead, Oliver gambles that Felicity can be counted on in the field for the first time. In a flashback, Malcolm (guest star John Barrowman) reveals to Robert Queen (guest star Jamey Sheridan) and Frank Chen (guest star Chin Han) painful details surrounding his wife’s murder, and how that shaped his plans for the Glades. Meanwhile, Tommy (Colin Donnell) stuns Laurel (Katie Cassidy) with the truth. 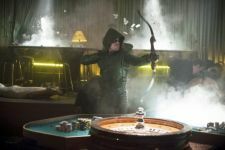 Arrow airs on Wednesdays at 8 p.m. ET/PT.